Tour an incredibly well-preserved Grand Union! It's no secret that the Lake Hiawatha Super Foodtown in Parsippany, NJ is a former Grand Union, but there is a surprising lack of coverage online. That is, until Styertowne posted a complete tour of the store on Flickr a few months ago. I kind of had a general idea that the Lake Hiawatha Foodtown was almost 100% intact from Grand Union, but I didn't really have a good idea of GU's decor packages (hey, in my defense, I was about six months old when C&S took over GU). Of course, I had to get my own pictures of the interior after confirming that it was a former GU - you never know when a store like this is liable to close, or in the other direction, renovate. This store became a Super Fine Fare for a short time, after extensive renovations, and is now operating under the independent City Supermarkets banner. This store is a former Stop & Shop that closed in 2013 after the opening of the nearby Village ShopRite. It is currently vacant. This store, which closed in 2014, replaced a Pathmark, which in turn replaced a Foodtown. So in a way, the location came full-circle. Today, there are hopes to get a new supermarket into the location, but no action has been taken. You'll notice the large number of carts lined up outside. The first time I was here was before Farmtastic closed, and there were fewer, much older carts that all said FOODTOWN on the handle. Now, all the carts are much newer and all read FARMTASTIC SUPERMARKET. Heading inside, there is a small alcove where Grand Union may have stored carts, but is now just pretty empty. This "Welcome To" sign is 100% Foodtown. You can see a similar style sign in a Foodtown in West Palm Beach, FL (although the store is owned by a different person, the same design firm likely produced both signs). When you walk into the store, you make a slight right turn under an arch that leads you into the grand aisle. Virtually all of the decor you see here is original from Grand Union. I'm willing to bet most of the fixtures are as well. If anything, the produce bins in the center of the produce department are new. There are refrigerated produce cases that line the wall to my left. The deli is immediately inside the entrance to the right. There is also a hot food bar, and a salad bar that seems to be open any time they feel like it. Other times, it's stocked with chips or bottled water (although they seem to be keeping it open more consistently now). The decor looks remarkably good here for being at least 15 years old. In the back corner of the grand aisle is the bakery department and "Fruit Bar". I'm not sure whether there ever was a fruit bar there, or if they just mean precut fruit, but nowadays it's just more regular produce. By the way, the chocolate glazed donuts here are really good. So are the onion rolls. Along the back wall of the store are the meat and seafood departments. There is actually a service seafood department that seems to be consistently kept open. Somehow this sign doesn't quite work. I get the idea, but it comes out as "Fish Fresh"! By the way, it would seem that the aisle markers are original to GU, but around the number it says "Fresh & Friendly Marketplace", a Foodtown slogan. I don't know if it was originally used by GU, but Foodtown now uses it on other stores as well. The second-to-last aisle is the dairy aisle. Both sides have dairy cases. At one end of the dairy aisle, there are some problematic dairy cases that seem not to work. At least, they've never been working the times I've been in this store. It seems the owners have some hope of getting them up and running again soon, though, because otherwise I would have stacked more products in front of them - maybe cases of water bottles or paper products, that would cover the entire area. The striped awning to the left above is the customer service counter. The last aisle is the frozen food aisle. The cases are clearly left from GU. In the front of the store, there is an indentation next to the customer service counter where the bread is. Hate to break it to you, Grand Union, but neither "ovenbaked" nor "tastyfresh" (to the left of the picture) are words. The front end seems to be pretty original from GU as well. The signs on the overhead structure are new, but I'd be willing to bet the structure itself is from GU. Behind me here there is an independent pharmacy, the Hiawatha Pharmacy. This pharmacy is independently owned and operated and was added by Foodtown in 2002 when they opened. It seems GU's customer service counter would have been there, and I'm not sure what would have been where Foodtown's service counter is. Here we're looking back towards the grand aisle from the front-end. The yellow walled area is the pharmacy. Although you can't tell here, the facade is similar to other GU stores, like this former location in Landing. The front wall in Landing comes out farther under the awning than at this Foodtown, and the interior layout is different (given its time as a Pathmark), but you get the idea. The Lake Hiawatha Super Foodtown is definitely worth a stop if you're in the area. Sure, it's an original GU, but don't forget it's actually a really good supermarket as it is today. It even has products and services you wouldn't expect in a store like this, like in-store bakery, floral, seafood, organic produce, and pharmacy. And it does seem like the owners are making an effort to improve - although there are still some kinks to work out. In that photo you linked to of the Foodtown in Davie, FL - while that one sign is from Foodtown, the rest of the decor you see is 100% 80's Winn-Dixie! I have to agree, that old GU decor looks really good for being at least 15 years old! GU really pushed themselves in their final years with fancy decor and new concepts, just for all of it to fail in the end. Yes, I've read about that store. Actually, now that I'm looking back, I believe that's actually the West Palm Beach store, I think I mixed them up. And it's amazing how that decor looks at least reasonably modern (that is, in design - not just that it's been kept up well). Do you know any more about the Foodtown Florida stores? For instance, do they use the Foodtown circular and/or storebrand, or is it something different? I find it a little odd - but not necessarily surprising - that some of our stores up here (Foodtown, Bravo, Western Beef, Price Choice) have made it down to FL. I guess it's to be expected because of the demographics of the areas being so similar. Both the Davie and West Palm Beach Foodtowns are untouched Winn-Dixies, so they're easy to confuse. What I know about the Foodtown Florida stores is that they started with 4 ex Winn-Dixie locations in 2006, although the Plantation and Merritt Island stores closed not long after opening. 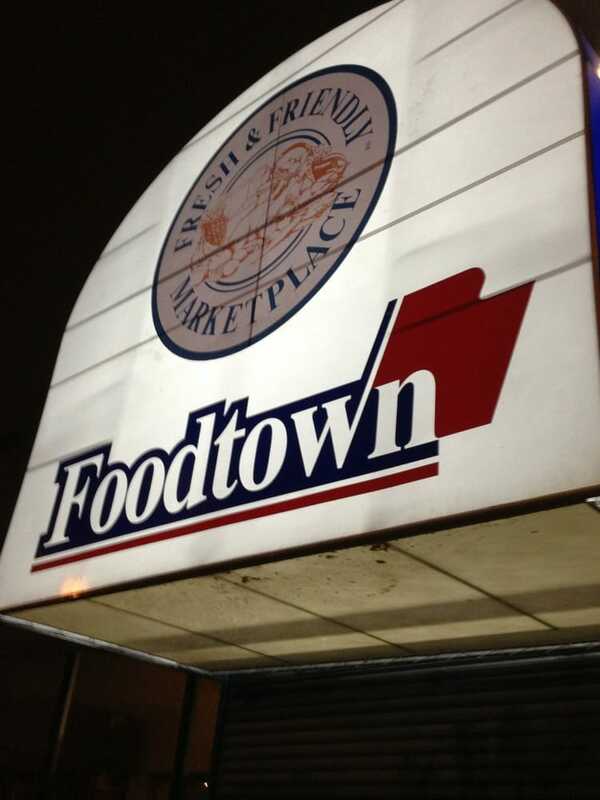 Foodtown completely shocked everyone when they were announced the as the winning bidder for those stores, and there were supposed to be more, but they never came. I've driven by the West Palm Beach Foodtown (and the Merritt Island one a long time ago), but I had to cut the WPB store as a stop on that trip due to a time restriction. According to the rudimentary Foodtown Florida website, they have their own special flyer (that hasn't been updated online since 2012), but I don't know what brand they carry. I highly doubt it would be the Foodtown brand, as it's a bit ridiculous for Foodtown to ship their own special products down to Florida for two stores. Although, the Florida Western Beef stores carry a mix of Western Beef and Supervalu brands, so who knows. One thing about Florida over the years is that many major supermarket and discount chains from the Northeast have tried to attempt to establish a Florida division, even if it was isolated hundreds of miles away from the rest of their store base (Pantry Pride, Grand Union, Zayre/Ames, JM Fields, etc. ), as well as the current ones you mention that exist today. Bravo is the most widespread of the grocery chains you mention in Florida, while the other three have stayed relatively small and confined themselves to only one part of the state (South Florida). Thanks for all the info! Yes, Foodtown Florida's website isn't exactly state-of-the-art. And as far as Western Beef goes, that's actually the combination of brands they sell up here (Western Beef and Farm Fresh, then Essential Everyday/Wild Harvest/Culinary Circle/etc). And I only actually learned about Bravo's FL division recently, and it really surprised me. I know, for instance, Price Choice (which is a Krasdale-affiliated store, like Bravo) has maybe three or four NYC locations, and then three FL locations using the same logo and everything - but as part of IGA! I don't think I'll ever understand the NYC/FL supermarket connection! You're welcome! We have a lot of NYC transplants in Florida, and my guess is these New York chains are hoping that the name recognition down here. Not only that, but the demographics are somewhat similar down here as they are in many neighborhoods of NYC. I guess Western Beef, Foodtown, and Price Choice can hold their own with their small, concentrated presence down here. Bravo has found the most Florida success though, as they probably have 30 or so stores here if I had to take a guess. I think they've been in Florida since the early 2000's from what I can remember, although they switched their name to Freshco for a few years as a part of an unsuccessful refresh attempt.